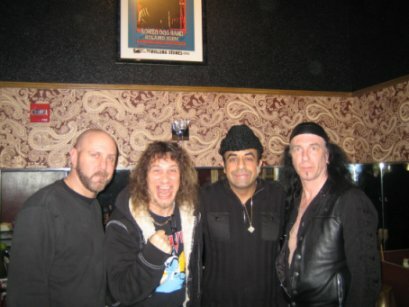 Metal Mayhem: The roots of Anvil began in 1973 when you [Steve Kudlow and Robb Reiner] met as high school friends. What are the influences for each of you as musicians? Robb Reiner: Black Sabbath, [Led] Zeppelin, Cactus, Grand Funk [Railroad]. MM: Any bands with a theatrical stance, like Kiss or Alice Cooper? RR: Sure. We love them too. Who didn’t love Alice Cooper?! MM: The band initially released its first record Hard ‘N’ Heavy (1981) independently, correct? MM: Was the band called Lips at the time of the initial, independent release of Hard ‘N’ Heavy (1981)? RR: For a short while. SK: Previous to that [Hard ‘N’ Heavy (1981)]. Previous to the signing [with Attic Records] we were originally called Lips. But because of the band Lips, Inc., the label did not want to put us out with that name. They did not things to get mixed up. RR: [It would be] confusing. They [Attic Records] also felt that with our music Lips did not signify the metal energy and sound we had. It was a decision to find something suited for the music. Lips did not mean anything. With [the name] Anvil you kind of know what it is. MM: What I am getting at is whether the Hard ‘N’ Heavy (1981) was ever released using the Lips band name? RR: Sure. There are 1,000 copies. MM: So those 1,000 copies of Hard ‘N’ Heavy (1981) must be worth quite a bit of money? RR: It is a tradable collectible item. MM: When you got signed with Attic Records it was released under the Anvil band name. RR: We changed the name and the album cover. MM: Was it shortly after the release of Hard ‘N’ Heavy (1981) that you [SK] got a call from Lemmy Kilmister to join Motorhead? SK: Not it was not until later, 1982. We were getting ready to record Forged in Fire (1983). Motorhead came to Toronto to play. For whatever reason that is when “Fast” Eddie Clark had a blow out with the other guys and was going to leave the band. 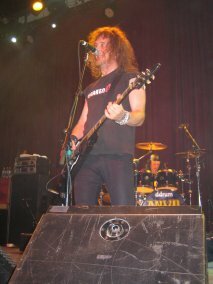 Lemmy called me and asked me if I would fill in and at least do Motorhead’s North American tour. I could not do because I was in the midst of writing and recoding Forged in Fire (1983), which came out after Metal on Metal (1982). MM: If the timing had been different, would you have considered joining Motorhead? MM: I presume that is because of your loyalty to Anvil? SK: Absolutely. Why would I want to joint someone else’s band when I have my own? I am the lead singer. Why would I want to become less than what I am? It does not make sense. MM: After Forged in Fire (1983) was released David Krebs [Aerosmith personal manager] approached you about representing Anvil as its personal manager, correct? SK: Yes. The label we were signed to [Attic Records] would not license our music in the United States and continues not to. So our first three records can only be bought as imports in the US. When he [Krebs] went shopping for labels, they all insisted they wanted the back catalog, which they could not acquire. Without the back catalog no record label wanted to sign the band. MM: Hard ‘N’ Heavy (1981), Metal on Metal (1982), and Forged in Fire (1983) are the classic records. I gather it is for that reason that Attic Records does not want to license those records for US release? SK: They would not do any licensing deals in the US. The main reason is that it is typical of the music industry that the head of the label was not very satisfied with the fact that they [licensees] wanted to pay so little for the titles. When you sell it cheap, they won’t pay you later. He knew that and that is why he would not do it. That continues to be the same situation today. The label [Attic Records] eventually went out of business and bankrupt. Attic sold all their product to another label called Unidisc [independent Canadian record label]. Unidisc now have offers from major labels. But, once again, not enough money is being offered. Therefore, Unidisc is not licensing those records. MM: Strength of Steel (1987) was the first record Anvil released on Metal Blade records. SK: We did not work with Johnny Z. We were at a crossroads. We had a choice of working either with Johnny Z. or David Krebs. David Krebs managed Aerosmith and offered us Spring dates with Aerosmith. At the time Johnny Z. was just beginning in the [music] business. 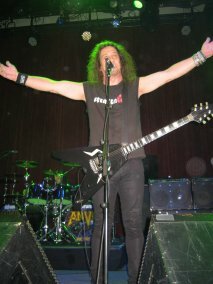 RR: Johnny Z. is responsible for bringing Anvil to America for the first time ever. He had a little record store and promoted a concert. 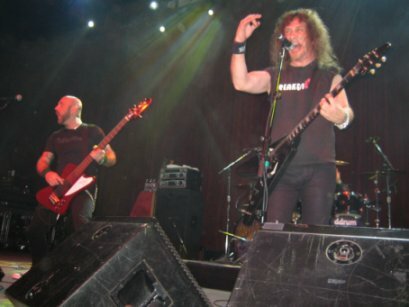 Anvil was part of that show. MM: That was in New Jersey, correct? RR: Route 18. It was a legendary show. People still talk about that show. MM: One of your [SK’s] quotes relating to “Anvil! The Story of Anvil” documentary (2009) is, “Now we’re getting praise for never selling out and sticking to our guns.” Hypothetically speaking, would you have receptive to the idea of hiring Desmond Child or Dianne Warren as a songwriter, releasing a platinum?selling record and doing an arena tour but only having short?lived commercial success until the onset of the grunge movement in 1990? SK: But were with another record deal [Attic Records] from 1983 to 1987. There was no opportunity. In fact all opportunities were closed down. That’s what kept us in the underground all along. There was never an opportunity. I can’t say what could have been because I was never there. MM: In the opening scene of “Anvil! The Story of Anvil” documentary (2009) when you are driving your car to Choice Children’s Catering you say, “It can never get worst.” You were being optimistic about things. SK: Absolutely. What could be worst than having unfulfilled dreams. I have been working at it my whole life. It cannot get worst than that. So it could only get better. It has! So my intuitions were correct. MM: Is there anything I can do as an entertainment law attorney to help with the licensing issue you face with Unidisc relating to your first three records? SK: There is absolutely nothing that can be done. It is iron clad. The original record contract is in pertuity. It is forever! The only window of opportunity happened when Attic Records went bankrupt. That’s when we could have used a lawyer. Unfortunately, we sat around with all the other bands signed to Attic Records. None of the other bands wanted to fight Attic Records with me. We went and had a meeting [with label mates]. Everyone else [other artists signed to Attic Records] said, “I don’t care if they fold. I am not going to pay for a lawyer.” No one wanted to pay to get released. Since there was no one representing ANY of the bands to tell the judge that the record contract says that if Attic Records goes bankrupt you guys [musicians] get your licensing back. At that point the judge slammed his gavel and said, “It’s done.” Once something like that happens, there is no going back! This entry was posted in Interviews and tagged Anvil. Bookmark the permalink. Pingback: Are you beach body ready? Pingback: enlevement epave gratuit 75. Pingback: Knowledge Without Application Is Useless. Pingback: Looking for awesome Flatmates? Pingback: Technology Careers at CSR PRODUCTIONS Entertainment Group, Inc.
Pingback: Are you ready to live your dreams?